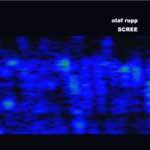 Scree is a record that reveals a musician at the height of his creativity. Everything that follows will sound different, can only sound different. Of course, Scree is the result of radical improvisation (and also in this sense everything later sounds different, since it is a matter of real-time compositions that are bound up with the moment of performing and are per se not repeatable). Scree is also the result of years of hard work on his own music. Born in Saarland, Germany in 1963, over 30 years a guitarist, 15 an improviser, and 10 living in Berlin, Olaf Rupp released his first regular solo CD, Life Science on FMP just over two years ago. (In 1999 there was a solo CDr, limited to 100 copies on GROB, September. A few copies have turned up during an inventory and can be ordered via head@churchofgob.com). Life Science was the product of different recording sessions and presented his playing on electric as well as acoustic guitars. By contrast Scree, purely acoustic, is from one mould. The path he tread with Life Science (or, if one wants, with September) has come to an end with Scree. Seldom has one heard guitar improvisation that is so thoroughly worked through, so fast, so virtuous and dense and so well thought-out-and if it's a matter of this-so withdrawn. Seldom has one heard improvised music that is so well-rounded and thereby so radically bound to the instant in which it is played. Olaf Rupp has played with Paul Lovens, Tony Buck, Joe Williamson, Uli Jenneßen, Paul Lovens, Johannes Bauer, Thomas Lehn, Wolfgang Fuchs, Aki Takase, Butch Morris, Aleks Kolkowski, Harri Sjöström, Stephan Mathieu ... and for four years he has been intensively grappling with solo playing. On GROB along with Götz Rogge he has released Beastieshopbeach (GROB101). For the next year a recording with Uli Jenneßen and Rudi Mahall is planned. There is extensive press material on Olaf Rupp and his music. It can be requested via www.audiosemantics.de.